Arinola Lawal is a third-year economics student and a regular writer for the University of Sheffield's We Are Sheffield Students blog. I found out Lee Child was a University of Sheffield alumnus sometime in early 2016. I was a first-year student and whilst I hadn’t read any of his books yet, I had a friend who was (and still is) crazy about his Jack Reacher series. So, it was exciting because it meant that, as a University of Sheffield student, I had a connection to a brilliant writer. I sent that message to my friend on 9 September, before I was even sure I would be able to attend the event and we exchanged feverish texts. When I found out I was going to attend Lee Child’s conversation with Professor Chris Wigginton on 6 October – a week before – I had to try not to set my expectations too high. I remember being a bit disappointed that I couldn’t find any seats towards the front of the Oval Hall when I arrived some minutes past 7.30pm. 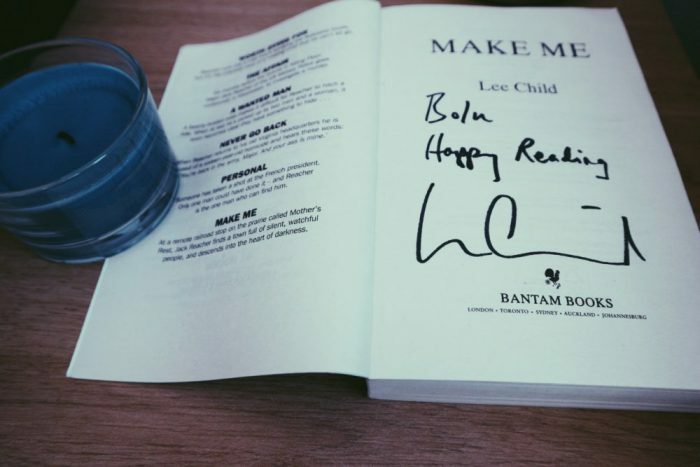 There were a lot more people than I had expected and while it meant I didn’t have as close a view as I would have loved, I was also pleased that there were so many other people who really enjoyed Lee Child’s work. The conversation between Lee and Professor Wigginton started almost immediately after I took my seat. It started out with a bit of background and I was amused by Lee’s admission that it took him four years to complete his three-year undergraduate degree. He spoke about his preference for Reacher’s nomadic ways and how that allowed him to write dynamic books he would not have been able to if he was writing about, say, a policeman in Chicago. Being a fan of J D Robb’s In Death series about New York’s Lieutenant Dallas, I was a bit miffed at this because he was right; Dallas always had a homicide or a slew of them to solve and hence, there is no element of surprise in comparison to Reacher. My annoyance didn’t last long. Lee was referring to Donald Trump and closely followed up by calling Harvey Weinstein a bully. At this point, I had decided that besides his incredible talent, I thought Lee Child was very cool. He told the story of how he became an author. It’s a bit of a funny one because, on one hand he was laid off from his job in theatre, which must have been unpleasant. On the other hand, his first book Killing Floor was released two years after that (by my calculations, as he mentioned that 21 June 2005 was the 10-year anniversary of losing his job). My sympathy became admiration when he explained that he wrote his first book out of instinct. The wave of admiration surged even more when I discovered that Lee has started a new book on 1 September every year ever since and that he makes a deliberate effort to ensure that his books are easy to read despite that fact that it makes writing more difficult. I am a huge fan of books that are not difficult to read and can only aspire to such discipline. On not changing things he’s previously written, Lee said, “I will never go back and change something.” He doesn’t believe in trying to make it easier for Reacher to find a way out of a situation. I wonder how many writers agree with this style and try to deduce if he would be in the majority or minority. I can’t decide, but I’m leaning towards the majority because if writers kept changing already written parts of their story, it would make their work a lot more difficult to follow. Professor Wigginton steers the conversation in the direction of perhaps the most burning question that Reacher fans have. Why Tom Cruise? Lee starts out cautiously by mentioning that a writer cedes control after signing a film contract, but ends up confessing that he is to blame for the casting. He had a split second to veto having Tom Cruise play Jack Reacher, but he did not. To him, the book is supreme, and he can’t understand why fans are so offended. He jokingly adds that he didn’t mind the millions worth of book promotion he got from the film. When asked about the end of the series by a member of the audience, Lee says he’ll keep writing until the readers ask him to stop because, “the writer is the servant of the reader.” He has also decided not to kill Reacher at the end; he says he’ll write Reacher settling in one place or getting a dog. I believe that Lee Child will keep writing, I am not sold on his promise to keep Reacher alive and I thoroughly enjoyed watching him speak.